North Bay and District Chamber of Commerce | Kudos from these three gentlemen! Kudos from these three gentlemen! As Vice-Chairs looking back on the biggest nine day sporting event in the City of North Bay we are pleased to write this letter in celebration and thanks! Let us begin by THANKING the Executive and Members of the North Bay Granite Club who in March of 2016 allowed us the opportunity of contacting the City of North Bay in hopes of having them partner with us in the pursuit of our dream. We thank Mayor McDonald, City Council and City Staff who backed our vision and the OHL Hockey Club – North Bay Battalion for agreeing to vacate Memorial Gardens for two and half weeks allowing us to proceed with the bid to host the 2018 Ford World Women’s Curling Championship. Thanks to the North Bay & District Chamber of Commerce and our local Media for assisting us to spread the word as we launched our pre-event sales campaign throughout North Bay & area, Northeastern Ontario and beyond. This campaign proved instrumental in proving to Curling Canada and the World Curling Federation that we could successfully place fans in the seats! We are so PROUD of our Volunteers – 401 strong; many of whom worked diligently and tirelessly from the beginning of our bid package to ensure all the t’s were crossed and the i’s dotted. 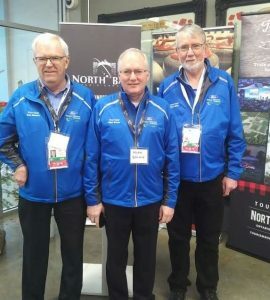 It is a testament to true teamwork and their vision to Welcome the World to North Bay that we were able to attract willing participants from the North Bay Granite Club, area Curling Clubs, the City of North Bay, throughout Ontario, Canada and International volunteers. We thank you one and all, for together everyone accomplishes more! We were so pleased to hear that all members of our thirteen teams athletes and coaches unanimously expressed their approval of our volunteer base at their Coaches meeting. They spoke highly of their compassion and assistance towards them and their families in attendance. We would be remiss if we didn’t send a special thanks to our North Bay Granite Club Manager Bobby Ray who fielded countless questions which were answered in a timely and professional manner. He also formed a team of Granite Club Volunteers to promote Curling in general and the North Bay Granite Club specifically at the Championship. An estimated 250 interested fans completed survey cards. This initiative was positively acknowledged by the World Curling Federation. And to our Granite Club Ice Maker Bruno Bin who among his other duties quickly transformed our curling surface so it could be decorated into what would later become the “Patch”. These gentlemen are truly dedicated and valuable staff members! Further with respect to staff members, our heartfelt thanks to employees of the North Bay Battalion (our Box Office Administrator) and to the staff at Memorial Gardens. And how about the “Patch”! From the initial Volunteer Appreciation Night through to the final day we received rave reviews for the wonderful job done by Cecil’s Brewhouse and Kitchen. Your hard work was immeasurable and truly appreciated. In addition we are truly APPRECIATIVE of our Fans! You may pride yourselves on being part of an attendance record for a World Women’s Curling Event held in Canada. Your knowledge and enthusiastic heartfelt applause was truly appreciated by all the athletes. You “Rock”! All our teams expressed gratitude to local businesses, and the community at large on the huge warm welcome they received everywhere they visited in North Bay and area. An event such as ours wouldn’t be possible without SPONSORSHIP. It is our pleasure to thank our Signature Sponsor Ford of Canada, the Season of Champion sponsors and our 36 local sponsors for all their support and belief in our efforts. We were thrilled by the positive reaction to our volunteer requests for assistance with such requirements as our Prize Patrol, Future Stars Program, Placard Holders & Pre & Post game entertainment. To the entire Staff & Management of Curling Canada, the World Curling Federation, TSN & WCTV. You allowed us on the World Stage and you showed us off to over 175 million people world-wide. It just doesn’t get better than that!! Finally, to our Event Manager Terry Morris and Office Administrator & Marketing Coordinator Amanda Mackenzie; you have been a pleasure to work with since day one and instrumental in keeping our ship on course! !